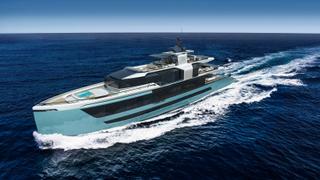 Turkish shipyard Sarp Yachts has revealed a new concept ahead of the Monaco Yacht Show, the 46.8 metre XSR 155. 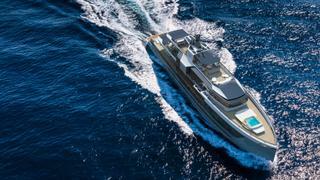 With exterior design by Red Yacht Design, the 500GT yacht features full glass living areas and spacious exteriors populated with loose furniture. Standout features include a beach club on the main deck aft which is equipped with a pool and spacious lounge area with sunbeds. A garage big enough to accommodate water toys such as Jet Skis, diving equipment and a 7.5 metre tender sits beneath. On the upper deck, an exterior lounge area is separated with glass doors while a large staircase and lift will connect all decks from the lower deck guest lobby. The comfort and privacy of the owner have been prioritised in the design, with the master cabin located on the foredeck, with an office, dressing room and his and her’s bathrooms. The master cabin also features two balconies on both the starboard and port sides, which can be operated by the owner without the help of the crew. The remaining four guest cabins sit on the lower deck and comprise two double and two twin cabins which accommodate a maximum of 12 people. The crew quarters, meanwhile, are located forward of the lower deck with the captain’s cabin located near the wheelhouse and ship’s office on the upper deck. 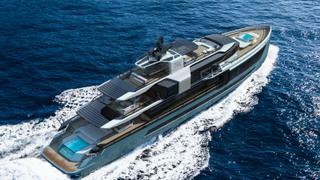 Power will come from a pair of 1500hp engines for a top speed of 16 knots and cruising speed of 12 knots.